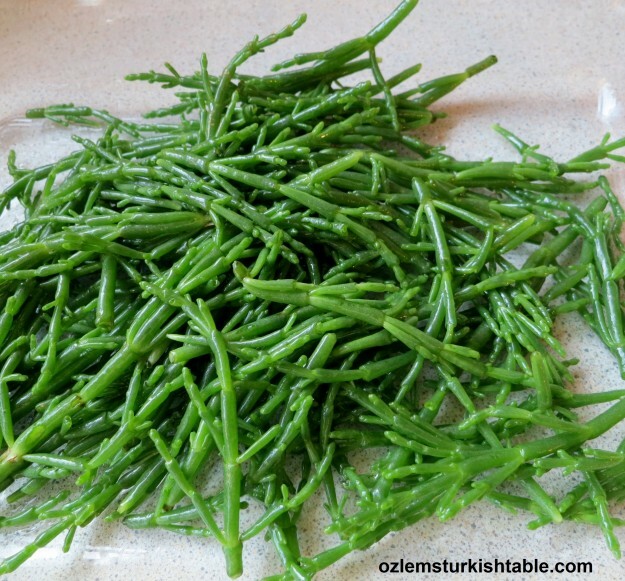 Have you ever tried Samphire, or as we call in Turkey, deniz borulcesi? Samphire is in season at the moment and I was delighted to find this delicious sea vegetable at my local market, what a treat. 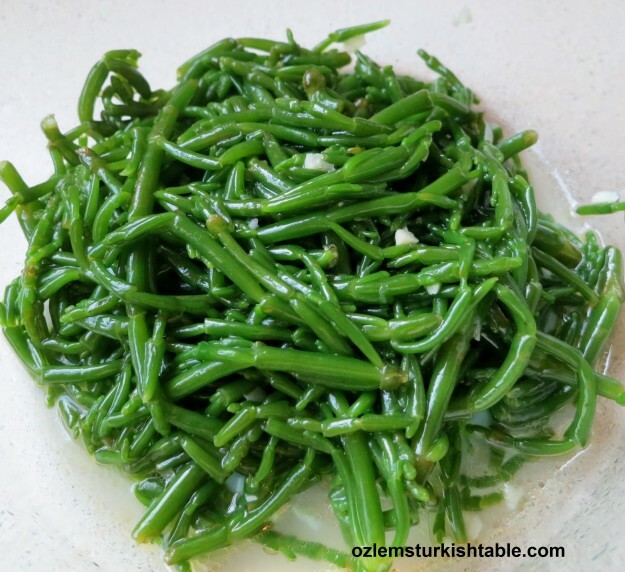 Marsh Samphire, deniz borulcesi, is a succulent plant of the salicornia species, not a seaweed and it is a popular mezze ingredient in the Aegean & Mediterranean coast of Turkey. Samphire is also a fashionable sea vegetable in the UK at the moment; it has a short season (July to August) so make the most of it if you can. A reader kindly also informed me that samphire is called sea bean in the West Coast, US – and that makes perfect sense-. It pairs any grilled fish beautifully and samphire’s crisp texture and naturally salty, succulent taste is the taste of summer at the Aegean for me. Just one bite and I feel the sea breeze, the turquoise Aegean calling for me straight away..
Samphire’s crisp texture and naturally salty, delicious taste is the taste of summer at the Aegean for me. Once described as the poor man’s asparagus, the mash samphire is not only delicious but very nutritious too. It is rich in vitamins A, B2, B15, C,D, amino acids and more. Some supermarkets, like Waitrose in England also carry samphire next to the fish counter, so worth checking out. Samphire is also delicious especially with egg, broad beans, for a vegetarian option. 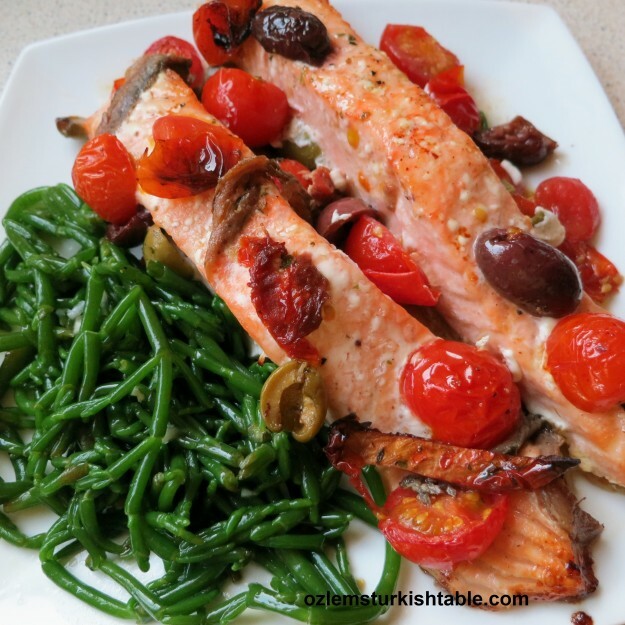 Samphire paired deliciously with baked salmon, cherry tomatoes, anchovies and olives. 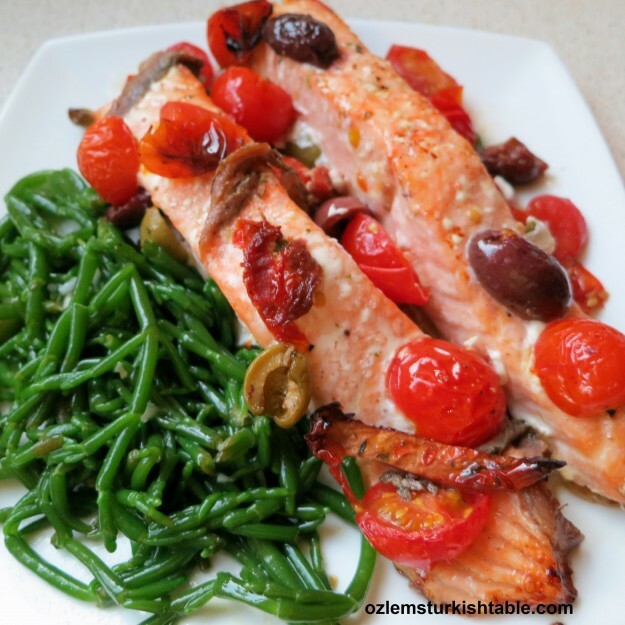 I prepared the samphire, deniz borulcesi, in a simple dressing of extra virgin olive oil, garlic and lemon juice, like it is prepared in Turkey for a mezze spread; this dressing complemented the samphire beautifully next to our baked salmon with cherry tomatoes, olives and anchovies. Avoid using salt, as there is plenty natural salt here through anchovies and the samphire or sea beans. A very easy and delicious recipe, l hope you enjoy it too. 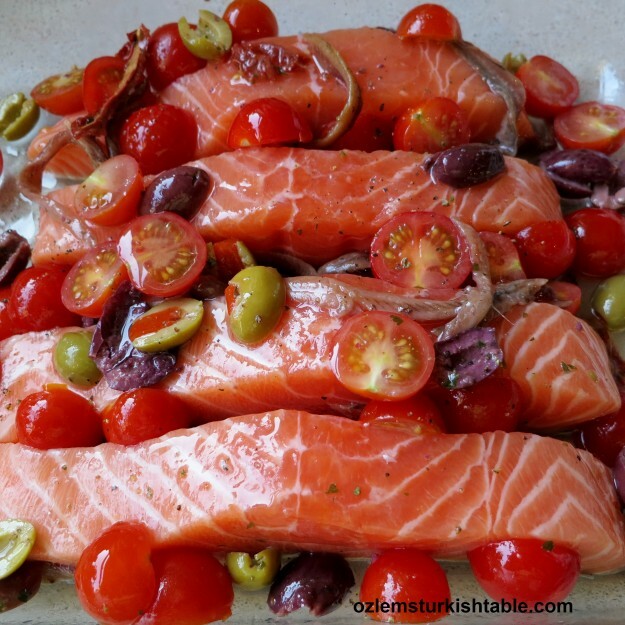 Spread the cherry tomatoes, olives and the anchovy fillets over and around the salmon fillets. Grease the baking tray with the olive oil and place the salmon fillets on it. Spread the cherry tomatoes, olives and the anchovy fillets over and around the salmon fillets. Season with ground black pepper. Place the tray in the preheated oven for about 20-25 minutes (please refer to cooking instructions at the packaging as cooking time may vary with the size or type of the fish), until the fish is cooked and the tomatoes starting to turn crisp at the edges. While the salmon is in the oven, prepare the samphire. Trim to remove the tough woody parts of the lower stalks and give it a light wash to remove any grit. Steam the samphire over a pan of boiling water for a few minutes. Cool the samphire in iced water and set aside in a serving bowl. Samphire is delicious with a simple dressing of olive oil, garlic and lemon juice. Combine the olive oil, chopped garlic and the lemon juice in a bowl and drizzle this sauce over the samphire or deniz borulcesi, mix well. Samphire in olive oil, lemon juice and garlic with the baked salmon; delicious combination. 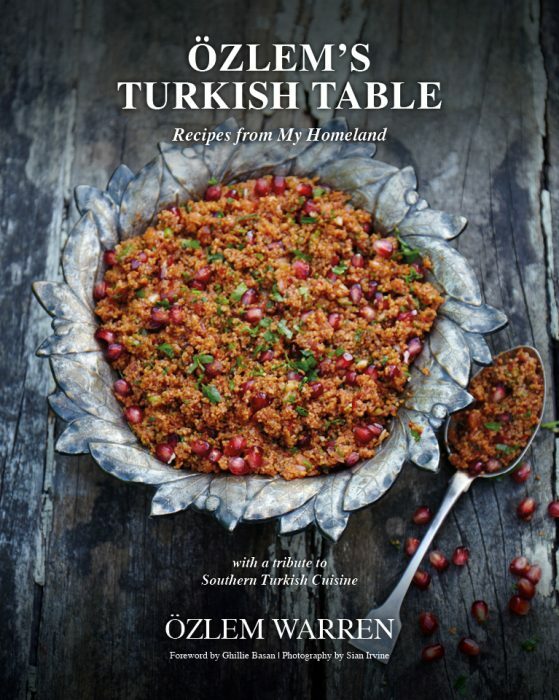 . . a delightful post Özlem with delicious samphire dishes and a reality check for those who may wonder if Turkey is safe in these turbulent times. It is, as those who are here know and those who are coming will find out. 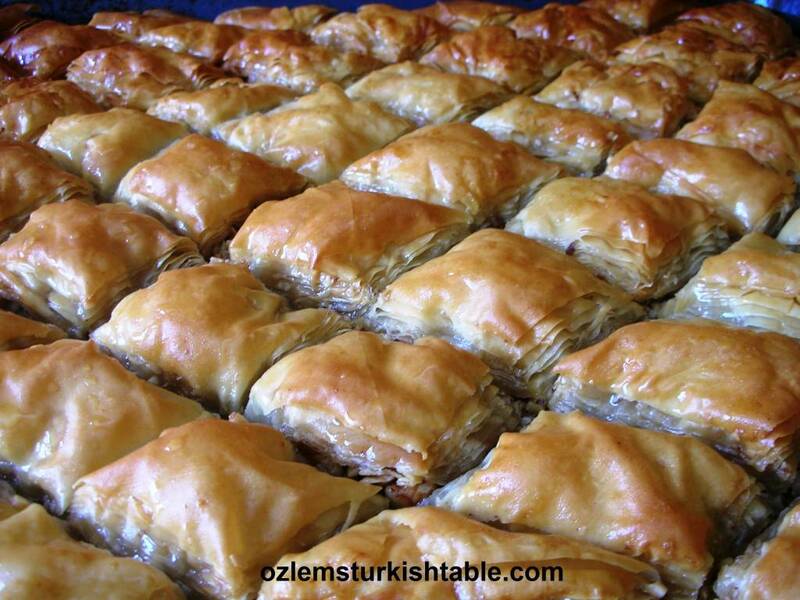 Özlem, I’m so happy you posted this recipe as I’ve always loved this dish in restaurants but have never had the nerve to make it as I’ve always heard it took a lot of preparation. We just got a very happy, very young visitor from America who visited us in our summer home on Burgazada. He stayed in the Taksim area and got quite a kick out of the protests themselves, met a lot of other foreign tourists who also felt the same and also is well on the way to loving Turkey (as we do). I agree with you that now is a great time to visit Turkey and meet the really interesting and wonderful people who live here! Such a lovely comment, thank you so much for stopping by and sharing this; how glad I am your young American had such a positive experience in Taksim; it is the place where the city’s heart beating at the moment; lots of young, smart students there – loved watching all the concerts, young minds standing up for humanity, in a very civil way, very impressive. Hope you can get to try samphire, it is such a treat, and really easy to make. Hi Joy, marvellous news that you’ll be back to Istanbul, I am sure you’ll have a wonderful time 🙂 There is a garlicy sauce with lemon and oilve oil here in this post, apart from that, I also love it with garlicky yoghurt – is it this sauce you were after? And yes, everyone’s hearts, minds, heads are in Istanbul, Ankara and Izmir right now but we’re all enjoying daily life here in Fethiye, too. Thanks for the mention. I agree Julia, if it is on offer, I do go for samphire, deniz borulcesi, big time! It has a short season so good to make the most of it – love it in garlicky yoghurt too 🙂 Hearts at home, and good to know life continues as normal in most parts, and sun is out in Fethiye! In the States, at least where I live on the West Coast, we call samphire “sea beans.” I only tried it for the first time a couple of years ago, didn’t really know how to prepare it (but liked it!) 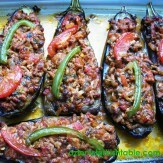 and had no idea Turks cook it in mezze! Thanks for this delicious looking recipe! My dear Ozlem, first of all, so happy to hear that Turkey and its wonderful spirit has endured and triumphed in these trying times! So happy to see markets and people moving around their day taking life in their stride. On another note, the salmon looks fresh delicious and perfect for summer. I must try to find samphire here, I’ve tried it out in restaurants:) xxPeri. I love samphire and cook it at every opportunity. It is great with poached eggs. We are certainly still in business in Bodrum and visitors are thick on the ground. Merhaba; we just had another batch of samphire, this time with garlicy yoghurt and poached eggs, you must have read my mind, such a delicious taste. 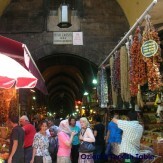 So glad to get your first hand info on Bodrum re visitors, thanks for that. Dear Ozlem I love to read your blog, and I have to said that I will travel soon to Turkey because of you 🙂 I just wonder if there is camping in Turkey. We want to travel by motorhome frome Norway to Turkey. You are welcome Ella, look forward to hearing about your adventures in Turkey! 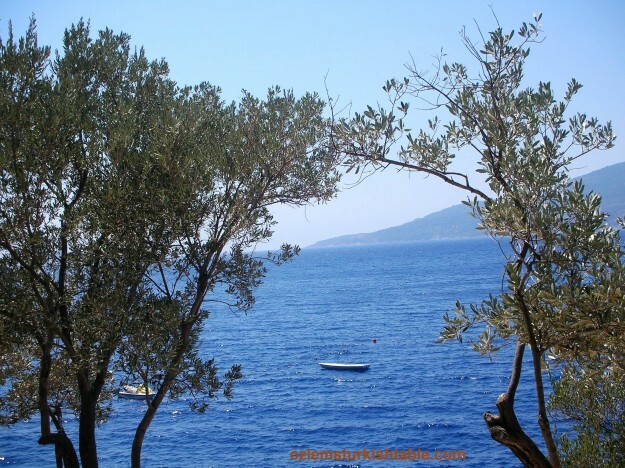 Hi again Ella, one of the fellow bloggers in Turkey, Back to Bodrum, also suggested you yo check out her friend Kath and Dave’s travels with their campervan around Turkey – here is their blog http://daveandkath.blogspot.co.uk/ – hope it helps! I was eating samphire yesterday at Giritli restaurant (the one where they row you out to a pontoon in the middle of the sea) – I love it and have to say it looks wonderful next to the salmon. 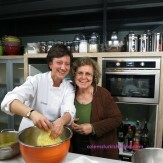 Ozlem, you may actually get me to use my kitchen one day!